Many times we needed to strengthen a small signal in the region of VHF or FM, or it is we lead a body, or a receptor. The preamplifier that to you we propose offers 20dB in all the region of VHF and it still can reach also their 500MHZ. 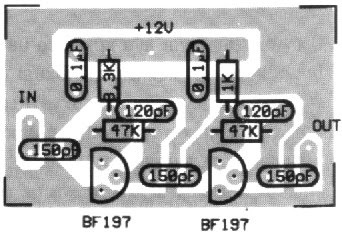 The amplifier is a circuit of high frequency RF with distinguishable materials. 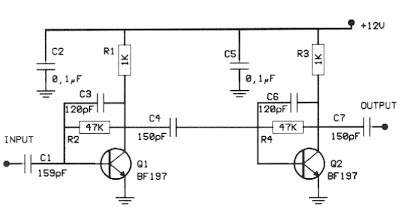 The amplifier as circuit strengthens the tendency of signal with concrete aid, depending on the frequency of signal. If the frequency of signal is included in the limits of spectrum of frequencies of amplifier, then it is strengthened, otherwise it is downgraded. Each amplifier of this category, accordingly with his designing, strengthens a concrete region of frequencies and obeys in same characteristics. The one that to you we present today concerns the regions of VHF where they exist and the corresponding television stations for channels 5 until 12. His circuit he is enough simple, so that it is made easily with materials that exist in the trade. 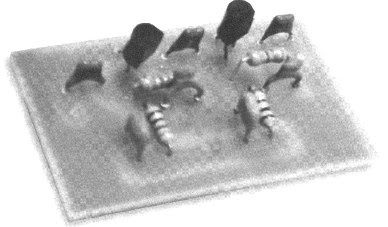 It is based on transistors with aid until the 500MHZ. The type of transistor can be BF197 or some other. The total aid of circuit, according to the elements of transistors, reaches 20dB. Enough aid for a lot of applications. The amplifier is drawn in order to it has big response of frequency up to 0,5Ghz. According to the particular characteristics of manufacture, the better application that we could to you propose for this designing would be the aid of television signal emanating from a small transmitter of television or the preamplifier of a frequency meter. 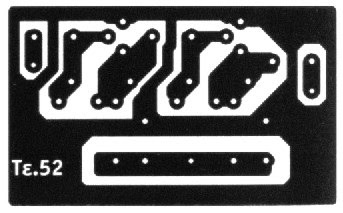 The assembly of amplifier is realised above in printing form 2. In this you will place all the materials according to form 3. The manufacture, in order to it works right it needs one small stabilised power supply 12V. The consumption of circuit is small hardly some mA. The resistance en line with the collector is 10 000. When you finish the construction and the control of manufacture, place the PCB in metal box of suitable dimensions.